The Middle Eastern diet falls under the category of a Mediterranean diet, which incorporates the foods and cuisines of the countries bordering the Mediterranean Sea. The Mediterranean diet has garnered praise for its role in keeping the body healthy and staving off chronic disease, especially cardiovascular problems. Both a Middle Eastern and Mediterranean diet emphasize the use of olive oil, fish, whole grains, fruits, vegetables and legumes as primary foods. If you follow this type of diet, you eat red meat, dairy and sweets sparingly. Since saturated fat and cholesterol are only found in animal-based foods, this kind of diet is very low in both. 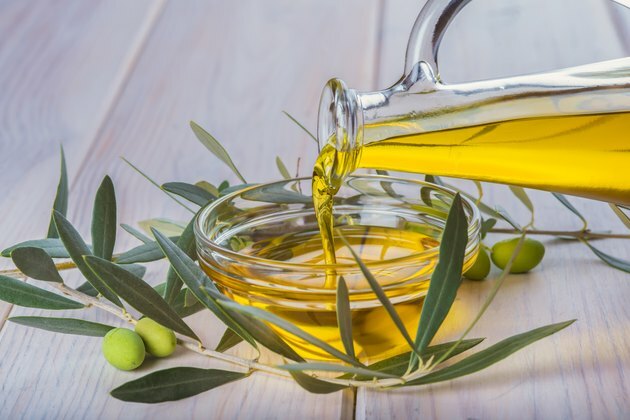 Instead, heart-healthy fats, like the monounsaturated and omega-3 fatty acids provided by olive oil and fish, are the primary sources of fats. On this diet, you obtain protein from legumes and fish instead of red meat or poultry. The biggest benefit to the Middle Eastern/Mediterranean diet is its effects on your heart. The reduction in meat and animal products leads to a less consumption of saturated fats. The Lyon Diet Heart Study, as reported by the American Heart Association, analyzed the effects of diet on the coronary health of individuals who had already suffered a heart attack. Patients were placed into two groups: a Mediterranean-style diet or a prudent diet. Those on the Mediterranean diet ate less saturated fat and animal products than the prudent dieters. The results showed a 50 to 70 percent reduction in a second cardiovascular event in those following the Mediterranean diet. Following a Middle Eastern diet can also benefit the health of your brain, cognition and overall mortality. An analysis published in the "British Medical Journal" in 2008 explored the overall health benefits of a Mediterranean diet. This review analyzed 12 studies that tested the effects of a Mediterranean diet on mortality, Parkinson's, Alzheimer's and heart disease of a total 1.5 million people. According to this review, a Mediterranean-style diet can reduce overall mortality and mortality from cancer or heart disease, as well as your risk of developing Parkinson's or Alzheimer's. If you follow a Middle Eastern diet, for breakfast, you might have a bowl of oats with a garnish of sliced almonds. For lunch, you might eat a fresh, leafy green salad topped with tuna and an olive oil and vinegar-based dressing, with a whole wheat roll on the side. For dinner, indulge in a falafel sandwich on pita topped with cucumber, beets, lettuce, tomatoes and tahini.